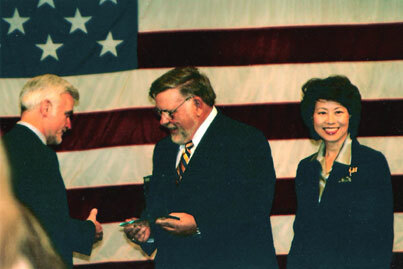 Cecil Roberts, President of the United Mine Workers of America, makes the presentation in honor of William B. Wilson to Robert Wilson, great grandson of William B. Wilson, as Elaine Chao, Secretary of Labor looks on. More pictures of the induction. 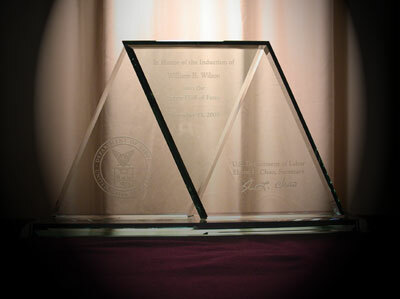 William B. Wilson was inducted into the US Labor Department's Labor Hall of Fame at a ceremony which took place in the Great Hall of the Department of Labor in Washington D.C. on November 13, 2007. Wilson was chosen for this honor for his many years of work toward helping the wage earners of this country improve the quality of their lives. The Labor Hall of Fame honors those Americans whose distinctive contributions to the field of labor have enhanced the quality of life of millions yesterday, today, and for generations to come. Elevation to the Labor Hall of Fame is arrived at by a selection panel composed of the Counselor in the Office of the Secretary, the Solicitor of Labor, the Assistant Secretary for Policy and the Assistant Secretary for Administration and Management. Honorees are chosen each year, and a formal induction ceremony is conducted at the U.S. Department of Labor in Washington D.C. The Labor Hall of Fame is located in the North Plaza of the U.S. Department of Labor, 200 Constitution Avenue, N.W., Washington D.C. The most recent honorees are represented by a kiosk containing a portrait, photos and memorabilia. The exhibit is open during regular working hours.